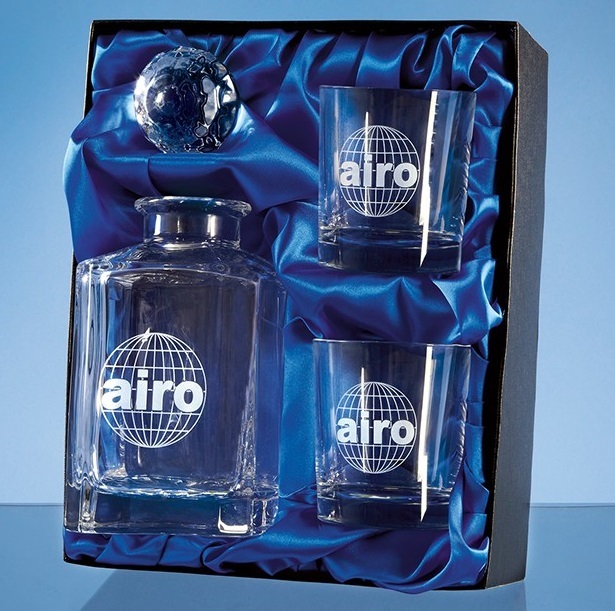 3 piece Whisky Set in a Satin Lined Presentation Box. 0.8ltr Crystalite Square Spirit Decanter. This distinctive square spirit decanter with facet ball stopper has been crafted from the finest lead crystal. The decanter measures 238mm x 100mm. It weighs 1.8kg unboxed. It has the benefit of a large engraving area that can be personalised with any crest, logo or wording to create a gift that is sure to take pride of place when put on display at home or at work. It also includes two 290ml whisky tumblers measuring 92mm high x 84mm deep.